Colorado’s public, school, and academic libraries offer their users a blend of technology services, learning opportunities, community activities, and information literacy initiatives. But what do these services and resources actually look like? We’ve sorted through a variety of data—from annual surveys to national reports—to provide a fresh update to our popular Quotable Facts report. We’ve highlighted some of our favorite statistics that we think help convey the importance of libraries of all kinds to the entire state of Colorado. 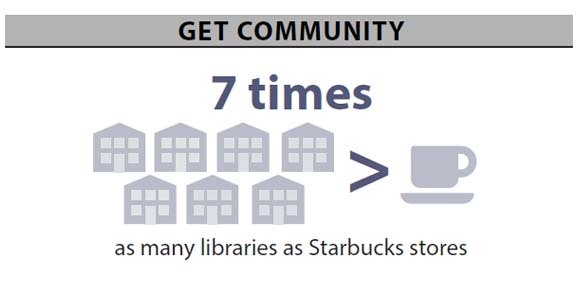 Did you know Colorado has 7 times as many libraries as Starbucks stores? And those libraries have more than 66 million visits each year, or more than 5 times as many as our state parks. For those technology buffs, 94% of the state’s public libraries offer technology training on tools like photo editing software and social media. With devices becoming more and more common, public libraries are increasingly offering wireless access (see our recent Fast Facts, Computers in Colorado’s Public Libraries) and saw more than 5 million wireless access uses in 2012, or more than 13,000 uses each day. And Colorado’s school librarians are making sure students are well-versed in 21st-century skills: Nearly 75% teach students how to use digital resources at least once a week. Check out our new Quotable Facts report here. Please share often! And, if you would like printed copies, please contact us. Note: This post is part of our series, “The Weekly Number.” In this series, we highlight statistics that help tell the story of the 21st-century library.